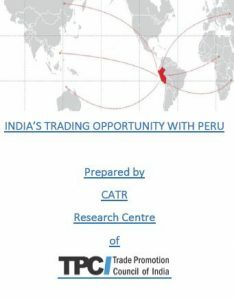 TPCI conducts extensive research and analysis of country level &amp; sector level trade data to understand potential and emerging markets and recommends strategies to tap them. Thus our reports would help companies remain competitive in the dynamic business sphere. In general, foreign investors in Peru receive the same legal treatment as local investors. However, foreign investment is restricted in certain activities, such as maritime services, air transport and broadcasting. The Government seeks to promote public-private investment partnerships, particularly in transport, energy, and other technology-intensive sectors, in order to overcome infrastructure bottlenecks, spur competitiveness, and uphold economic growth. The investment incentives generally consist of tax exemptions and low-cost financing. Normally, they do not distinguish between domestic and foreign investors. Peru has made considerable improvements and also knows where improvements still lack. This demonstrates its clear vision and strong motivation to reach its goals. Peru’s example shows the benefits of maintaining an open economy especially when trade is made an integral part of a country’s development strategy. 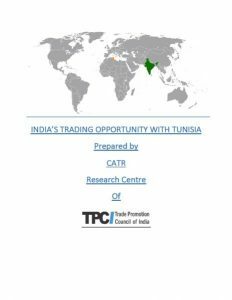 India’s trading opportunity with Tunisia. Tunisia appears to be a stagnant economy in terms of GDP growth and imports growth in goods and services. This report, in an attempt to bolster trade between India and Tunisia, has identified a list of products and services that hold the potential of steering trade growth. Other than this product- based identification, India must also look at the future policy agendas of Tunisia, and align its trade negotiations with Tunisia’s long term goals. For example, the country in its 2020 roadmap stresses heavily on building and renewing transportation- rail and road, bridges and stations, metro rail networks. Similarly, infrastructure opportunities exist in water desalination plants and related pumping stations and supply network. This agenda of the Tunisian government offers two opportunities to India- one, supply of raw materials and two, advisory services. After all these economic considerations, one must understand the political story of Tunisia, such as its young democracy, small private sector, presence of terrorism, and most importantly, its financial dependence on developed world. 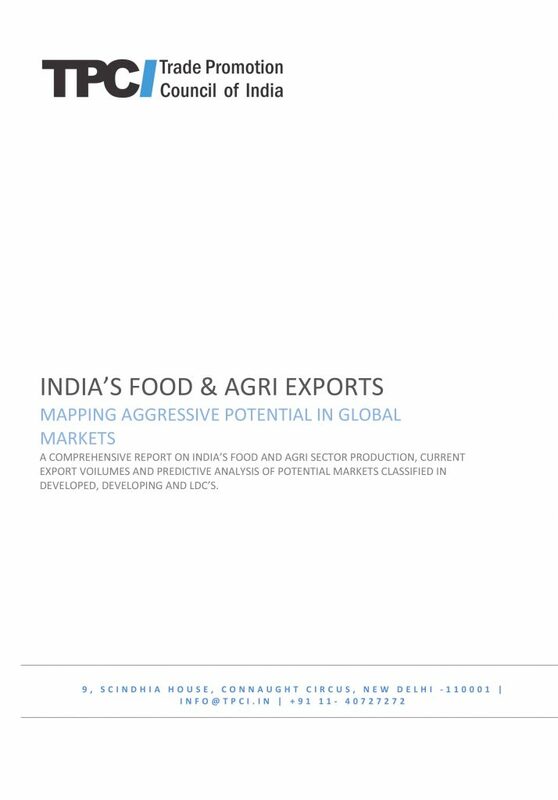 The report explores products (agricultural and non-agricultural) in which India has substantially large export potential to Canada, considering India’s huge production base of the specific commodities and the huge demand for the same in Canada. Although Indian exports to Canada has been increasing year on year, the major share is occupied by USA, Mexico, European Union and China. The reasons for India’s low share in Canada’s imports include high tariffs imposed, high freight and transportation costs and also several SPS and TBT measurers enforced by Canada. The report consider those product categories, especially Indian food and agricultural products, in which India has a competitive production edge over other competitors. Since India is not able to comply with quality standards and norms of Canada, it is not able to export these products in large quantities to Canada. The study focuses on how India can tap the top export destinations of China such as USA, Japan, South Korea and Vietnam as with weakening Chinese position in the global market. After 2010, the Chinese Economy suffered a continuous decline in growth rate of GDP, imports as well as exports. The downturn is evident from the fall in the growth rate from an average of 9.9% for 2005-14 to 6.9% in 2015. The decline in growth has spillover effects over the world and also on the Indian sub-continent. Since India is one of the fastest growing economies in the world, it becomes an opportunistic situation for Indian exporters to capture the markets lost by Chinese industries This would not only help increase India’s exports but also help in the revival of consumer demand in the world, amidst the global economic glut. This report tries brings out the potential which India can fetch the benefit from Iran’s import. India needs to primarily develop some of her key segments in the manufacturing sector such as Machinery, electronic, electrical equipment, vehicles other than railways and tramways. Iron and steel tops the list of Iran’s import together consist of 40% of Iran’s import. Indian products which are exported to Iran are mainly primary commodities with low gross value attached which ameliorates in making our exports values truncated. In this study importance of processed food and agricultural products has been highlighted by studying the trade structure of top 20 processed products as per India’s competitiveness. We have highlighted the lag in export despite the competitiveness and existence of significant trade values and justifying the same by listing the top crucial or aggressive Processed Agricultural Food and Allied Products. 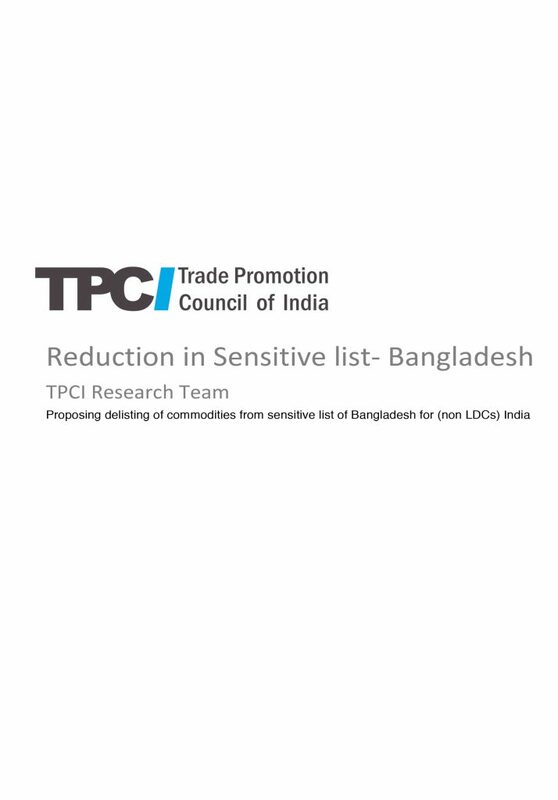 This paper aims to recognize the items to be proposed to be pruned from the sensitive list maintained by Bangladesh for non-LDCs (India), after analyzing the commodities presently considered in the list, based on supply-demand, competitive pricing, geographic advantage (transportation cost) and RCA mechanism. It has been figured out that 18 non textiles related commodities and 6 textiles related commodities should formidably be considered to be removed from the list, out of the 34 non-textiles and 17 textiles related high potential commodities recognized through the study. 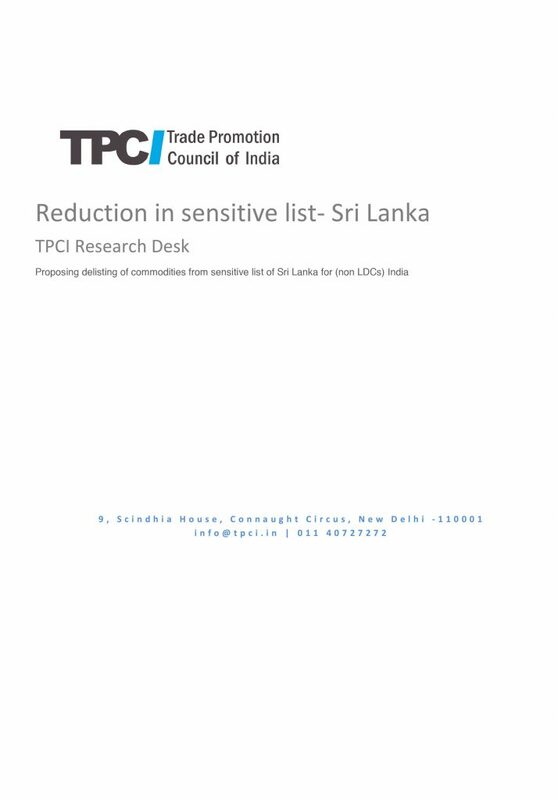 The study suggests an approach to reduce Sri Lanka’s sensitive list under SAFTA. The concept of Revealed Comparative Advantage has been used to pair the RCAs for products on Sri Lanka sensitive list with the corresponding RCAs of India. Four categories of items are generated based on competitiveness of India or Sri Lanka on each of the items. This process helps in identifying items in which Sri Lanka is competitive and those where the India is not competitive. Such items are recommended for removal from Sri Lanka’s sensitive list. Items that are vulnerable to competition include those items where the India is competitive but Sri Lanka is not. Such items can remain on the sensitive list and can be removed gradually in a phased manner. This report figures out the potential of Indian exports for Mexican markets mainly focusing to tap manufacturing products which has high value addition and thus can escalate India’s exports. As the economic scenario of Mexico is improving, India has an opportunity of strengthening the trade relations with Mexico especially focusing on exporting Indian manufacturing products which already has presence in Mexican markets. Moreover Chinese economy is dwindling with lowest levels of global exports amalgamated by huge debt to GDP ratio and so far the lowest levels of growth rate in GDP.